I am contemplating a *new* 50-size nitro aircraft engine for a project I have and I would truly value all of your expert opinions. As a bit of a back drop, I have been flying RC for about 40 years and I've flown several different brands, i.e. OS, Super Tigre, ENYA, K&B, Moki, Saito, even Cox...to name a few. So, I may have experience, but I am certainly not an expert on engines by any means. What is the best, highest quality and most reliable nitro engine in the market? Personally, I really like Enya and Moki: OS has been a hit or miss for me, but I read mostly positive reviews from fellow modelers. My .60FX is horrible. For me I don't rate my engines on their power; I rate them on their total performance - manufactured quality, reliability, dependability, and durability. I want an engine that always runs well, smoothly, very high quality, and purrs like a kitten. My OS .60 has never run well and I've had a professional engine guy at my former club (SCCMAS) try to figure it out w/ no luck. The best I can say about it is that I have certainly become an expert @ dead stick landings!! Please share your views and opinions with me. Tom, I'm not a big fan of any OS engine made past 1990. That being said I had no issues with a .61 FX that I once had. I too was a member of SCCMAS 1997-2014, I can't really recall anyone out there in recent years I would comfortably call an engine expert. I voted for Rossi because not only do they make great power but they are very reliable and easy to operate. Last edited by speedracerntrixie; 03-13-2019 at 11:53 AM. That's the same year range I belonged to SCCMAS although I left in 2010 I think. The guy I was working with was a retired fellow - Kent Kollings (if I remember the name correctly). Great guy...great teacher. We tried about everything to get my OS to run. Pretty much ended up overhauling the entire carb. Sometimes you just get a dud, I guess. He kept telling me that it was "loading up" in the air; yet it ran fine on the ground. 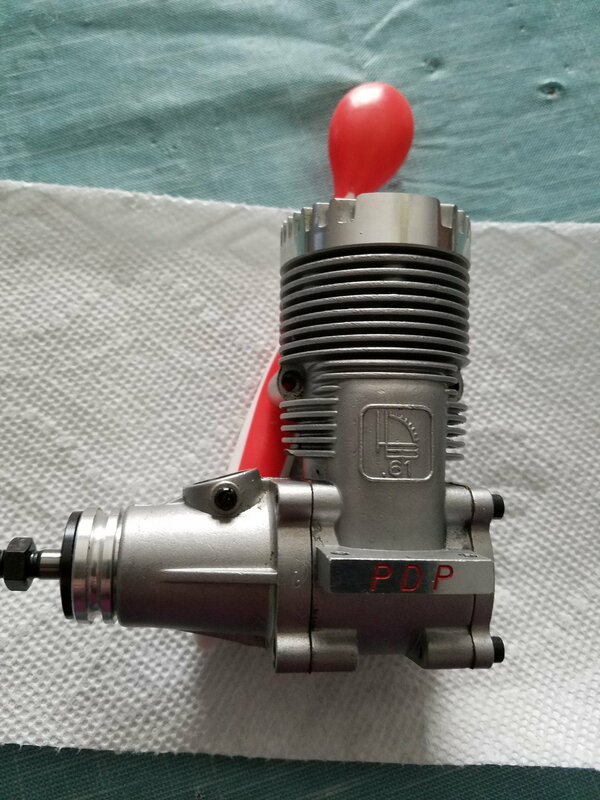 We tried different props, different plugs, different fuel. She would start easy and seemingly run fine but nearly every time she'd die in the air and I'd dead stick'r in. I've never owner or run a Rossi, but I've heard plenty of good things about them. Pretty pricy $$ though. I'm looking at an OS 40 4-stroke (older Surpass engine) and also and older Enya 46-4C 4-stroke. I had been looking at the OS 56 alpha as well. I have used K&B .61 engines for years as I have several of them. Even though they are an older design, they have always been my favorite 2-stroke .61. They are not much bigger than a .45, are very light and put out decent power. They are extremely reliable and durable as they are double ball bearing, have a steel chrome plated cylinder with an aluminum ringed piston. They are still made by MECOA but you can buy an excellent used one for $60-$70. The are not a high RPM engine as you need to keep the RPM at around 12,000 or less for long life. They have a pressed in crankpin and continuous RPM at 13,000 or more can cause the pin to fail (I have done it). I run 11x8, 11x9 and 12x7 APC props (about 12,000 RPM) and the torque is there for great performance. They are also very good on fuel consumption. If I recall correctly Kent was rather tall, soft spoken, grey hair that could have been in a pony tail. The way he had you trying different things and claimed that the engine loaded up while in flight would lead me to beleive that he didn't have much of a handle on the situation. When in flight an engine will gain a few hundred RPM over on the ground. This will tend to lean the engine slightly. It's very rare for an engine that is running rich to quit in flight but very common for an engine to quit from being lean. The newer OS construction ( ABN ) is far less tolerant of lean runs then a true ABC construction. Another good sign of someone who really knows engines is they tune the engine according to what it does in flight not what it does on the ground. Im sure we crossed paths at some point, my main interest during that time frame was IMAC. If you saw somone flying a 40% yellow Extra or an Orange Extra odds were it was me. I also participated in the Triangle series of pylon racing, both .46 modified and unlimited classes. Ended up winning season championships in both classes with Rossi engines. Yep, that was Kent! I guess that from my perspective of being one that is by far NOT an engine expert, he seemed very knowledgeable and that he knew what he was doing. But that was just my perspective is all. I really liked SCCMAS, but it was a quite a drive for me: I lived in Pleasanton at the time. Your reply sparks an interesting debate and another set of questions from me. I grew up in a very tiny farming community of ~1500 in northern Michigan. T'was one of these towns where everyone knew everybody right down to what one had for dinner every night practically. Anybody committing any form of dishonesty and the news spread like wildfire even if there were no substantiated facts. In that era and in that town if a fellow modeler offered to sell you a "used" engine you could certainly trust them that it was a worthy purchase and the engine was good. That was long before RCU and long before EBay. Unfortunately, in this day and age when somebody tries to sell a used engine to me I never know who or what to believe anymore. I once had a very trusted LHS try to sell me what they claimed was a brand new engine. They pulled it out of their showcase in all of its glory w/ the box & paperwork. Everything was still wrapped in plastic. Almost immediately, though, I noticed through the plastic wrapping that the throttle linkages looked rusty. The LHS owner attempted to explain that this was normal. Then I noticed that the engine mounts had clear signs of bolt marks. With that the LHS owner confessed that, "Alright, the engine was sold to me by a friend and he claimed that the engine was mounted in one of his planes, but never run. So I am selling it as brand new." Then I looked into the exhaust port and could clearly see that there was black oil residue and scoring on the piston. The LHS owner promptly defended this by saying, "Okay, okay, the fellow may have run the engine once or twice, but you can see it's in perfect condition." Another time, I had a guy sell me a NIB engine from an online auction. I get it and find that the crankcase is cracked. Long story short, who do you trust anymore? And, what exactly does "Used but in Near Perfect Condition" Or "Used, Mint Condition" or "Used, Excellent Condition" truly mean w/o having the engine professionally checked out? So to answer your question, yes I guess I was really looking for a brand new engine even if that means NOS. That brings up the second topic: New Technology vs. Old Technology. In the 70s and 80s when I was getting into the hobby, there were 2 names in town: K&B and ENYA. The debate on these was just as fierce as that w/ cars; American vs. Japanese. Then a couple of the guys got hold of Super Tigre engines and these became the absolute rage. I like all three and currently have an ST .61 in my SIG King Kobra. My very first engine was an ENYA .09, which I still have. The ENYA's have always seemed to run silky smooth for me, and have been very reliable. Now, though, even though ENYA still makes engines they are hard to come by except seeing them regularly pop up on EBay or RCU. My question, though, is that I've heard and read tons in the forums from guys that absolutely swear up-n-down that the older engines from Super Tigre and OS are far superior than the newer ones. On the converse, I've heard and read equally as much in the opposite direction that the newer engines are better. As I mentioned before, the OS 61 FX I have is just a dud; however, the newer OS engines seem to be all of the rage. The new OS 4-stroke Alphas seemingly look, sound, and perform very well and the reviews I read are stellar....are they truly? The older ST round head engines are seemingly very excellent; today's ST engines sell for very minimal prices everywhere I look and nobody seems to want them anymore. What is fact vs. fiction? If you want the highest quality and fit and finish, you cannot go wrong with Novarossi or Dub Jett. The customer service from Dub Jett is stellar. That is, if you’re looking for 2-stroke. SCCMAS was once the premier site in California. Then people's egos started taking over. They started having perceived issues with the competitive pilots and really cut back on holding events. The club president in a newsletter authorized all members to police one another and then all hell broke loose. I had one occasion where the wind was blowing the left to right. While on landing approach with a 40% Extra I had one member yelling at me stating that I was over one of the ponds. First off, you should never raise your voice to another member for any reason, secondly he created a safety issue. I had one disagreement with Kent. I was flying a .40 size P-51 pylon airplane and had the engine go lean so I throttled back to idle and attempted to transition back to to part throttle but no dice. I called out dead Stick and headed for the runway. Kent happened to be on approach and had to abort to give me access to the runway. Afterwards he came up and questioned why I called deadstick with a running engine. I informed him that although running it would not transition, he walked away less then happy. When I moved to Sacramento I did not miss SCCMAS. Back to engines. I too am of the older is better crowd. I own several OS 2 strokes but nothing that was made after 1995. To remain competitive with the market they had to make some changes. These changes make for an engine that just isn't the same. I haven't bought a new engine besides a YS 4 stroke in over 15 years. EBay and swap meets are where I look for engines. Last weekend I stumbled onto an OS .61 RFP. On inspection it had been rebuilt with a new piston/liner and bearings. The pump did not appear to have been tampered with. I couldn't hand the gentleman the 65.00 fast enough. Tom, Once again, when I first read your post I suspected that you might be nervous about considering a used engine.That being said if you can inspect the engine, or get a money back guarantee, it might be less of a gamble. I have occasionally picked engines up at swap meets, some times as runners, and sometimes for parts. The last internet engine I bought was a Kraft .61. A friend found a couple of engines fairly cheep. He kept one, and offered me the Kraft. It was a true NOS never been bolted down engine. When the Kraft was introduced, it was just another one of several good pattern engines. The price was reasonable, and all I want it for is a Jensen Ugly Stick.The reason I commented about Super Tigre is that after many years of manufacturing in Italy, production was moved to China. I've never had a Chinese built Tigre, but a lot of the feedback on the net has been uncomplimentary. On the subject of technology consider the Veco/K&B 61. It's probably close to a 50 year old design. Over the years it's had updates, but basically it close to original. Today we have .50's, and 55's that will produce the same or more hp, Years ago all our engines were loop scavenged, they turned larger props at lower rpm's. 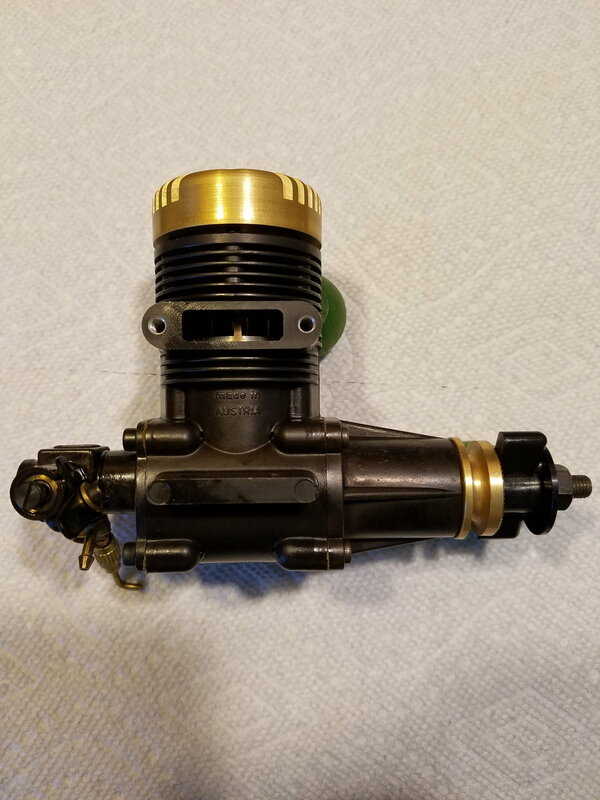 In the early 70's the Schneurel .port engines were developed, that turned smaller props at higher rpm's making more horse power.So technology has brought us better designs, but that doesn't necessary mean better quality. OS used to be the gold standard for quality. Some will say that's no longer true.Consider Thunder Tiger. They started out some 40 years ago copying OS engines in Taiwan. Gradually they came up with many of their own designs that performed exceptionally well, especially considering their price. Then production was moved to China, and quality went down. If you decide to consider a used engine, try to get help from someone who could inspect it, or at least suggest what questions to ask. Good luck on what ever you decide to do. I entertain myself from time to time by watching SCCMAS YouTube videos. There's definitely some good ones out there. Especially the one with the guy flying the giant scale Zero w/ total collision with another guy flying a helicopter. And yes, there were definitely some arrogant folks flying there. I only ever flew in the early evenings on weekdays and so there was rarely anyone ever there. Previously I belonged to Diablo Valley RC up in Pittsburg. Great club; great people but it was constantly windy there so 90% of the time you'd get to the field and not be able to fly. Anyway, I was always taught and have subsequently taught my son that it's far better to invest in known high quality products rather than be cheap and by crap only to have to go buy it all over again later. I was wondering about Thunder Tiger engines. I've heard and read many good things about their engines except on the inverse of what you describe. Thought I read somewhere recently that the company picked up a handful of OS engine designers and as a result their late model 4-strokes were stellar performers. I missed out on a NIB ST 75 round head (NOS) on EBay the other week that sold for a mere $128. There's an ST 40 round head up for auction now, but I am skeptical about its true condition. As I said before, growing up K&B engines were the household name and I remember when they came with the Perry carb and pump. To your point about having someone inspect a used engine, I don't know how to do that when buying off of EBay and unfortunately none of the guys in the club I was just recently in were any more intelligent about engines than I am. The only guy I know is Mr. Bennett (Bennett Built) from a few miles north of me here in Granger. What do you think of the newer OS alpha series 4-strokes? That 56a looks incredible and the reviews I've read are really good. Tom, I had forgotten that it was reported that Thunder Tiger hired some of the OS engineers who developed their 4 stroke engines. I have very little 4 stroke experience with Thunder Tiger, and none with the newer OS Alpha series engines. Jett engines are the best in that size without a doubt! Easy to start, very powerful, great carb with incredible throttling. I have around 30 or so .40 to .50 size engines. Jett .46 is my favorite. Second favorite OPS Monza .40, third Skyward .40 made by Picco. Jett engines are the best in that size without a doubt! Easy to start, very powerful, great carb with incredible throttling.
. Jett .46 is my favorite. Second favorite OPS Monza .40, third Skyward .40 made by Picco. have you even flown any of the later model HP engines ? Some people like Chevy, Ford, Honda, Toyota, Hyundai, Tesla, and never owned the other brands to compare. Same with glow engines. The fact the OP said he's owned many and feels he's not an expert, and asks for random input, just seems odd to me. Three times he bashed OS in the thread. I've been in the hobby for about 40 years myself, from control line to RC, and voted Rossi. Saito wasn't on the list. ​​​​​​Haven't enjoyed the cost of Rossi glow plugs, or their fuel consumption, and certainly wouldn't throw an OS in the trash either. Not a K&B fan, not an Enya fan. Not for RC. They were great for C/L. OS were always disposable engines for me, run them two seasoned and dump it fast on Ebay before the engine wears out. Not a nickel fan. I had 7 years on my Rossi, ran like new. Nowadays, I'm just too much a 4 stroke guy. Easy on fuel, easy on my ears, and I don't even need a glow starter. I like back flipping the prop. Well....it's like this, J330, most of the guys in ALL the clubs I have been with have owned and flown dozens of planes over the span of their hobby-life. Most of these planes have been ARFs. As such these guys know how to open a box, use a few basic hand tools, and assemble what comes out to be a dang nice looking airplane with all the spiffy finishing touches. They throw in an engine and they go fly their shiny new plane. They may have 100s of hours of flying time and may have been in the hobby 40, 50, 60 years. If you ask them, though, what do they really know about an airplane the answers I have received are, "truthfully, not much." It is a far cry different to build a model from a kit or even from scratch like I do, have thoroughly studied flight principles and aerodynamics like I have, are able to differentiate high quality building materials from poor like I am, and truthfully call oneself and "expert" modeler than it is lie about it and say the same thing when all a person has done is assemble parts together from a box. That's what I am saying about my knowledge and expertise with engines. Yes, I have owned and operated many different types of engines in my life. Have I tore them apart, inspected how they've been manufactured, assessed their performance...etc. like many of you have? No. We all have our strengths; we all have our weaknesses. I am a mechanical engineer by education and training. I've designed dozens of electro-mechanical tools and pieces of machinery in my life. I know the mechanics of engines pretty well, but I am not an engine designer. I know when my car engine is running correctly and how to maintain it properly, but I am not a certified engine mechanic. So maybe it seems odd to you that I am seeking input from fellow modelers, but the wisdom and knowledge that all of you guys (and gals) bring to the table far surpasses my own. Hence, it's wise of me to not rely on my own judgement, but to also seek that of others. My dad - God rest his soul - could run circles around the very best electricians, plumbers, and HVAC people out there, but all he had was a high school education. Do you get my point? The voting tool only allows for 4 selections otherwise, yes, I would have included Saito, Thunder Tiger, Super Tigre, NovaRossi, MVVS, and many others. As it is, I included only those engines that I have some practical knowledge of. And in truth, I am not bashing OS. If you read my posts all I said was that the OS 61 FX I have has never run right and that other people whom - right, wrong, or indifferent - I have considered "experts" couldn't get it to run right either. Does that mean I don't like OS engines? No. It just means I have few data points of comparison with them, which is again why I am seeking advice from folks such as yourself. I guess I should have qualified my request better. From my limited knowledge from only sources of reading, JETT, Rossi, and NovaRossi engines are very high performance marvels intended for racing or competitive applications. Truthfully, though, I didn't know NovaRossi made anything other than buggy/car engines. True or untrue I don't know. The Moki's I have had all were excellent engines, too. I like my Saito 125 GK. What I am trying to get a better picture of, though, is why some engine brands are vastly more sought after than others? Over the years I have heard and read dozens of views and opinions about Super Tigre (for example). If you go onto EBay or RCU, folks are unloading their Super Tigre engines for incredibly low prices, why? I see the same thing occurring w/ OS engines to some degree. And when you watch these auctions and see that there are few takers logic dictates that you have to question when so many fellow modelers see these ads but are passing them up, does this mean people are questioning the quality and reliability of them from their own experience or does it mean more so that more and more modelers are choosing to go electric and gas due to the cost and messiness of glo-fuel? My guess is that it's probably the latter; I don't know that for sure, but when I read articles online I am gradually learning that the quality of Super Tigre may have declined dramatically when the manufacturing moved to China. OS on the other hand seems to be making steady strides to ever improve their engine quality and performance. Despite my limited experience I would have to argue that going w/ an OS engine is a very safe bet. I tend to agree about going 4-stroke, which is why I have been seriously looking at the OS Alpha series four strokes like the 52 and 56. The reviews are really great for these. With all of that being said, I am just trying to make a wise decision on my next engine purchase and I cannot emphasize enough how much I value yours and everybody else's view and opinions above my own. That's another engine brand I have been very curious about - HP! But honestly I get confused between HP and HB....are they the same. Please share your thoughts on these. Sport Jett, Novarossi, Picco, etc. all make high performance engines. True. But they don’t need to be used in racing applications. They’re popular with 3D because their carburetion and performance/reliability are so impeccable. Sport Jett engines are just that - sport engines. The LX series engines are high performance engines based on racing heritage. They are one step below racing engines. The L series engines on the other hand, are torque engines. Designed for larger props at lower revs. The difference is the Jett will turn the same prop faster and smoother than any OS or ST engine or about any other sport engine of similar or same displacement. Email Dub Jett and give him your specs/needs and he will tell you what engine you need and how much it’ll cost. He builds to order. No other sport engine is made that way. I guess I better qualify my previous messaging even more. When I think of model engine "experts" I also think about the guys that can take pretty much any engine and re-engineer, overhaul, or totally rebuild the thing. For instance, I'm really impressed with the guys that can take a glow engine and convert it to gas. Yes, I can take my engines apart and clean them and lubricate them...etc., but I consider that all just basic maintenance work. Likewise, if I strip out a bolt or need to replace a part w/ a like-for-like part, those are things I have knowledge of. But I know plenty of guys that have been flying RC for years that cannot do those things either. I've seen them get frustrated with their gear and just throw it all in the trash rather than spend a little effort to get things fixed. What makes some of these engines, e.g. JETT, Rossi, MOKI, NovaRossi...etc. so much better than others? Is it the manufacturing process? Is it the quality of the metals and metal alloys used? Is it the porting, the bearings, the design? All of the above? Evolution engines look really sweet, but I've never read anything really great about them. There was a time when I read that Magnum, Aviastar, ASP, and Thunder Tiger engines were total junk, but on the flipside I've read posts from guys that swear by them. I love to hear examples from folks that run a given engine for years and state that these engines still run and perform like new....tell me more!! It's the ones that share stories about buying a brand new engine and having it run great out of the box for a couple gallons of fuel and then share horrors of these engines literally falling apart w/ broken rods, shot bearings, rough idling...etc. that really worry me and those are the engines I want to learn enough about to stay away from them. Clearly this means that some engines must be built for short duration high performance, yes/no/maybe? In the 70's soooo many fliers I was around swore up and down that FOX, ENYA, and K&B were the best of the best of the best, but here and now I read otherwise. Last edited by the Wasp; 03-16-2019 at 11:13 AM. Rossi .45 is also a very good engine. Just a bit heavy. HP,s are light but average power.